It was very late at night. Once the museum was empty of human beings and the lights were low, it was the usual thing for Deidre to hop over her little barrier and toddle along the hallways to visit her friends. In recent weeks the Dodo had become quite pally with Maude. Maude had been kept in storage for a good many years and only recently had the museum authorities rediscovered her, dragged her out, and put her proudly on display in a case at the top of the stairs. ‘What’s a Tigon when it’s at home?’ Deidre had asked, the first time she happened by. She squinted at the Maude’s information plate. Maude was resplendent with pale gold fur and the faintest, most elegant stripes. She held her head proudly erect and crossed her hefty paws, sprawling comfortably in her cabinet as all the stuffed animals came by to examine her. ‘My mother was an African lioness and by dad was a Manchurian Tiger,’ Maude announced. ‘A Mancunian Tiger?’ asked Deidre. She was sometimes slow on the uptake. ‘Hey, chuck, you’ve got all the animals coming by to see you. You’re causing quite a stir. And they’re all mad jealous of you. You’re so much more glamorous than that humdrum lot. All those plain old monkeys and boring bears.’ The Dodo gave a honking laugh. Maude had become quite fond of her new friend. The Dodo was squat, waddlesome, foolish and slightly pretentious, but she was frank in her admiration of the Tigon. She had taken to visiting Maude nightly, filling her in on who was who in the museum, and the little bit she had gleaned about the world outside its dark, castle-like walls. She was pleased to show off her knowledge to Maude. ‘What? The what?’ blinked the Dodo. ‘Paris on Christmas Eve!’ Maude growled, astonished that the bird didn’t seem to know what she was talking about. ‘You’ll have to explain,’ said the Dodo. ‘We’ll have to do something about that,’ Maude said fiercely. Deidre was listening to all of this, agog. ‘It sounds magical,’ said the Dodo. The thing worrying Maude was: did Deidre actually count? If they went all the way to Paris, would she be turned away for not being real enough? The Tigon nipped out of her glass case one night – very carefully, so she didn’t actually shatter anything and make a mess. She padded through the museum halls to consult with one of the oldest of the revenants in the whole collection. They called him Stan, and he was a T Rex towering two stories high. He was frozen forever in an attitude of ferocious attack (which he actually found rather taxing. All that constant attitude.) Visitors to the museum loved to take selfies with him, and so it was imperative he always looked his most ferocious. Maude had paid him a number of visits and they enjoyed the camaraderie of high class carnivores. The instinctive rapport of those who had once shared the topmost point of their respective food chains. ‘Hallo, there!’ he roared down the airy gallery, spying Maude’s approach. She greeted him fondly and wasted no time in explaining her quandary. ‘It all sounds wonderful,’ said Deidre. Maude gulped. She was only making the Dodo worse. She was getting her hopes up. Somehow, no matter how much magic was involved, Deidre didn’t think she’d be able to fly all the way to Paris. She couldn’t picture herself floating over the high, dark gables and turrets of the museum, let alone going any further. Just the thought of her stumpy, fluffy wings flapping away made her feel bilious and tired. She imagined the way Maude would fly. She’d be magnificent and lithe, bounding through the clouds. I’d only hold her back, Deidre thought unhappily. No wonder the Tigon looked as if she was having second thoughts about these Christmas plans. That night Deidre wandered about the museum, visiting a few old friends and seeking out their opinions. The British woodland creatures thought she was being a fool. Badger threw up his clumpy paws in horror at the thought of venturing as far as the continent. Rabbit threw up a number of sensible objections. Fox threw up a stuffed Robin he’d eaten. Deidre went to ask the painted faces from Ancient Egypt what they thought. ‘This Maude person is dragging you into something rather dangerous,’ one of them said. Deidre looked up at the calm, beautiful faces and sighed. This room was one of her favourites in the whole museum. She was standing before a cabinet of delicately painted faces recovered from sarcophagi. They were so unfathomably old and wise they made Deidre’s papier-mache head spin. ‘Do you really think it’ll be dangerous?’ the Dodo frowned. Of course, failing to recognize danger was the downfall of her whole silly species. A wave of sadness crashed over the Dodo. The Egyptian faces gazed down on her with great compassion. But what could they say? How could they help her? They couldn’t imagine wanting to leave the museum and travel elsewhere. They loved being on display here and seeing the variety of faces that came to inspect their own. And it was a thousand times better than being in a nasty old tomb, any day. This outburst stiffened her resolve. The rest were too timid. What was the point of being able to come to life anyway, if you weren’t prepared to do anything with it? And so the following day they waited impatiently for the visitors to file out of the building and for closing time to come. Outside the early evening traffic plied headlights through the snow that had started to fall on Manchester. As the indoor lights went out and the museum staff bid each other festive farewells and locked up all the doors, Maude, Deidre and the others perked up. ‘Who will come with us to Paris?’ Maude bellowed at the assembled stuffed creatures. They quailed at her ferocious teeth and her outrageous plan. ‘What, none of you..?’ she roared. It was a tradition which very few remembered. It had been a long time since anyone had left the museum on Christmas Eve. Deidre looked abashed, but very pleased with the idea of her own courage. He muttered, ‘You’re right. I’ve become tetchy over the years. People don’t even ask me to do magic stuff for them anymore, in case I turn on them capriciously and do something nasty. It all comes of being on display so much. I feel over-exposed.’ His cabinet was unique in that it could be seen from both inside the hall and from outside in the street. He was supposed to be an exotic enticement to passersby, which he found wearing. Maude was patting her friend’s wing with her paws. Deidre was aware of the comforting weight of her claws. And then the claws were gone and Maude was patting her hand. Her hand? Why, they both had actual hands. Warm, fleshy hands with blood – real blood- running through their veins. It was strange and unknown, this whole sensation of being human and being made of actual flesh. To Maude it was a long-ago feeling, filling her with nostalgia and glee all at once. To Deidre it was wholly novel and queer. She had never been made of flesh and blood. All at once the two of them were sitting side by side in an aeroplane, with a stewardess helping them to fasten their seatbelts. There were only moments until the plane took off for its Christmas Eve flight to Paris. ‘Wonderful,’ said Maude, eyes sparkling. It snowed over England and the Channel as they flew. Flakes whirled past the dark windows. Deidre grimaced, sitting back and gripping the armrests for dear life, completely terrified. The look on her face made her companion burst out laughing. Deidre in human form had a large bulbous nose, a receding chin, a skinny neck and hair that came in fluffy grey tufts. She still looked every inch like herself. She was even making anguished, strangulated Dodo noises as the plane caromed through the night. It ascended through layers of cloud and falling snow into unfathomable heights of deepest blue. Maude drank in the ancient stars with a sigh. ‘Oh, how glorious.’ She encouraged her friend to look. Deidre was dumfounded by everything for the full duration of their journey. The flight passed in a delirious flash and suddenly they were landing and disembarking and being ushered through customs quite smoothly. (Eric was a marvel! He’d magicked up passports and crisp new Euro notes stashed in their handbags like the lining of a plush nest.) ‘He’s most thoughtful, that crab spider,’ Deirdre said, following her friend onto the travelator and the escalator to the railway station, where the Paris train was waiting. ‘Isn’t he just?’ Maude smiled, watching her own reflection in the train window as it sped through the concrete suburbs. Their carriage was packed with all manner of people bound for the city. Some were clearly heading home for the holidays, laden with parcels and bags. Others were in their finery, looking forward to an evening of fun. Deidre sat squashed close to her more worldly friend. She wasn’t used to being out in the world at all. If she was honest, Maude, too, was finding it all quite bewildering. Everything had moved on so much since the last time she had roamed abroad. Everything was lit up and automated. There was electronic voices coming out of the very air, and all the humans had telephones they communed with as the train rumbled along. And yet the skyline of Paris as they approached seemed very much the same as ever. The pale form of Sacre Coeur on the hill over there. The Eiffel Tower, all shimmering gold. Everything seemed more or less as Maude remembered it. All of a sudden they were beneath the centre of the city and there was the crush and the confusion of the Metro station. They were hurrying up tiled stairs with hundreds of human beings and then, all at once, they were out in the open. It was snowy and dark and they were by the river. The air smelled different and delicious. Deidre was just about keeling over with excitement. Maude was standing halfway into the busy road, yelling for a taxi. Eric had really excelled himself. He had organized everything so that this was a proper holiday for the two ladies. There was a reservation at a boutique hotel near Notre Dame. Here Deidre became giddy with excitement, running herself a bath that lit up with rainbow colours and churned all the water into bubbles. Maude thought it was a bit much, but Deidre was delighted. ‘I’ve never had a bath before!’ She flung off her clothes with abandon. ‘What am I saying? I’ve never been human before.’ Indeed, sitting in water was a terrifying idea to her everyday self, as it was to all stuffed animals. They ventured out into the Latin Quarter for dinner, where restaurant owners stood in busy doorways and called out to them, trying to tempt them indoors. They opted for fondue, sitting in a bistro window, and a waiter brought chunks of raw meat for dipping into hot oil. Maude had ancient hunger pangs stirring inside of her, and Deirdre was happy picking at a salad. The Dodo became happily sloshed on Cote du Rhone. When they realized it was coming up to midnight they left a wad of notes on the table and dashed out in search of another taxi, this time demanding to be taken to the Jardin des Plantes. Of course it was, as their driver had tried to warn them, locked and bolted for the holiday. When Maude thrust money into his window and growled at him he hurriedly drove away. Then, without a second thought, she took a run up and leapt easily over the metal gates. Deidre gasped and applauded. She was gobsmacked with admiration. The gates squeaked open, Maude let Deidre in and together they hurried to the main entrance of the bulky shape of the Natural History Museum. ‘They won’t,’ Maude said, steadfastly. ‘You’ve been worrying too much,’ Maude said, though she was worried too that Deidre was heading for an upset. 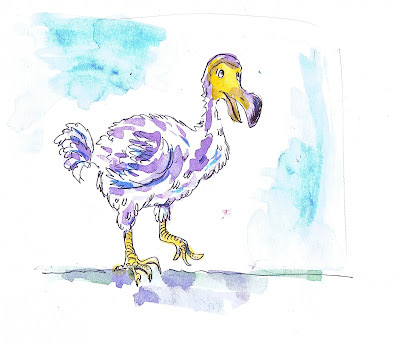 ‘I must be brave,’ the Dodo said, and marched towards the front of the building. It looked lifeless and dark in the snow. It looked like there was nothing at all happening within. But all kinds of things were happening inside. Even a hundred feet away, if you listened very carefully (and if you had the right sort of ears) you could hear the strains of a band playing a very elegant tune. You’d hear the reckless timpani of a rhythm section at work on the ribcage of a suspended blue whale. And you’d hear the trembling and thrumming as a thousand stuffed party guests jitterbugged, foxtrotted and freestyled any way they wanted across the polished wooden floors. The place was swarming with endangered animals from the whole world over. All of them were having a fantastic time. This was their only night out in the whole year and they were intent on having a ball. At the reception area Deidre’s eyes were out on stalks. So entranced was Deidre she hardly noticed the bouncers giving her the once-over. One was a Californian Grizzly Bear and the other a Chinese Salamander. They waved Maude through no problem, and spent only a few seconds staring intently at Deidre and her shiny beak. The hulking great bear and the salamander shook their heads and waved them through. What a fantastic pair they made – Deidre waddling with her chest puffed out, and Maude slouching calmly – into the heart of the party. A cheer and a ripple of applause for the long-absent Tigon! A whoop and a carillon of welcoming laughter for the ungainly Dodo! Also, perhaps, a not-unfriendly gasp or two. Even in this gathering of the rarest beasts on Earth, there was a range of rarity and a spectrum of the seldomly seen and both Tigons and Dodos were among the most infrequent of attendees. A space opened up in the middle of the floor. ‘Shall we dance?’ asked Maude, with a purr. ‘Why not?’ squawked Deidre and slapped her turkey feet on the floor and shuffled her bottom and twitched her tufted wings. Around them swept a mad jumble of birds, beasts and reptiles. She caught glimpses of Japanese Sea lions, Leopards, Forest Turtles, Bactrian Camels, Sumatran Orangutans, African Penguins, Volcano Rabbits and Tasmanian Devils. There was even a Steller’s Sea Cow – huge and lousy at dancing – bobbing its grinning head high above the crowd. Dead for more than two hundred and fifty years and game as anything. And could that possibly be a unicorn? ‘Are there completely impossible animals here as well?’ she honked at Maude. ‘They’re letting in made-up beasts of all kinds!’ whooped Deidre, and they danced with a great deal of brio and vim, until they were completely worn out, and went to check out the buffet. ‘What a wonderful spread!’ Deidre gasped. Marshmallows in every colour, popcorn, puffed wheat and cakes made of multi-coloured rice crispies. Everything was guaranteed to make one bloat up and swell. It was just the kind of food stuffed animals love to eat at parties. All the drinks were bubbly, too. There were a few snide comments at the buffet table from a nasty-looking Nonesuch – a fake mermaid from a museum in South London. She had taken against Deidre at first glance and muttered something about her head being obviously modeled out of papier-mache. Maude came at once to her friend’s rescue, roaring one, twice, three times so loudly that the glass eyes of the Nonesuch almost fell out of her awful, withered face. And the spiteful ersatz mermaid slunk away. Everyone else they met that night was very nice to Deidre. ‘Really? Me?’ asked Deidre. They were lolling on deckchairs on an upper gallery, eating marshmallows and sipping champagne, watching the party in the atrium below. ‘I do,’ beamed Deidre, and burped. Later, when the party was winding down and it was the early hours of Christmas morning they went up to the museum’s rooftop to watch the snow falling on Paris. They stared at the frosty river and the towers of Notre Dame. And they watched as little groups of stuffed animals took to the air to float back home to the museums of the world. Off they went in fabulous dribs and drabs. And so they stood together watching the extinct and rare creatures twirling away from the party. Light as snowflakes, fading in the dawn. The Fabulous Animal Jamboree - the end!